Homecourt isn't really basketball. Oh, sure, technically it is - there are lines on the court, a couple of rims, and a round, bouncy thing that the players all want. But this isn't basketball - it's an epic sideshow of seemingly every stylish way a supernatural meth-binging freak could manipulate a ball, hoop, and backboard. Yes, the gameplay remains almost unchanged from the way the corporate gods decreed it when Street first bombed us on the PS2. This yields an instantly accessible, nostalgic, and clock-eating title perfect for tournaments with your super-pals.But the game lacks the evolution (sorry Kansas) that would elevate this properly into a next-generation amazement-fest you’d continually sacrifice your hygiene for. Besides the new animations and upped polygon count, your sputtering PS2 could have handled this gameplay upgrade, resulting in fun that’s polished but too familiar. 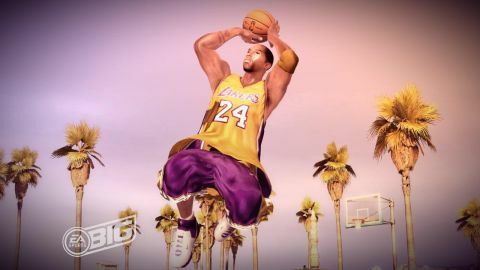 Description The NBA Street series makes the jump to next-gen with eerily lifelike character models (complete with that all-important next-gen coat of sweat).